Added on April 25, 2014 by Adrian and Shane. 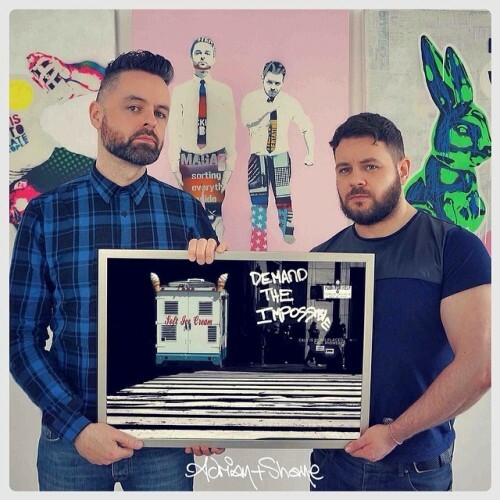 'Demand The Impossible' - a new piece by Adrian+Shane is being showcased in New York as part of a group exhibition opening tonight (Friday April 25th 2014). ‘FOR THE LOVE OF NEW YORK’ features the work of over forty creatives from all around the world presenting artwork that was inspired by the mecca that is New York City. Encompassing many styles and genres of creativity, the works selected for this show display the diverse eclecticism that make up this great city. This exhibition will include: painting, illustration, photography, graphic design, typography, scrimshaw, taxidermy and jewellery. Exhibition runs until Sunday April 27th 2014.